I would like to order some Tallerian Sisters, do you know when I should be able to order them locally in Germany? Wolf riders look cool. Thanks for the image. We will be taking it into account, just like we took into account the right handed bows after feedback on our FaceBook page (and are now looking to supply either left handed bows, we'll ask the backers but are currently sculpting the alternative versions all the same). Perhaps put major issues into a vote, we'll certainly check with big attention the comments in the KS draft page, we are waiting for some final images to make it public. 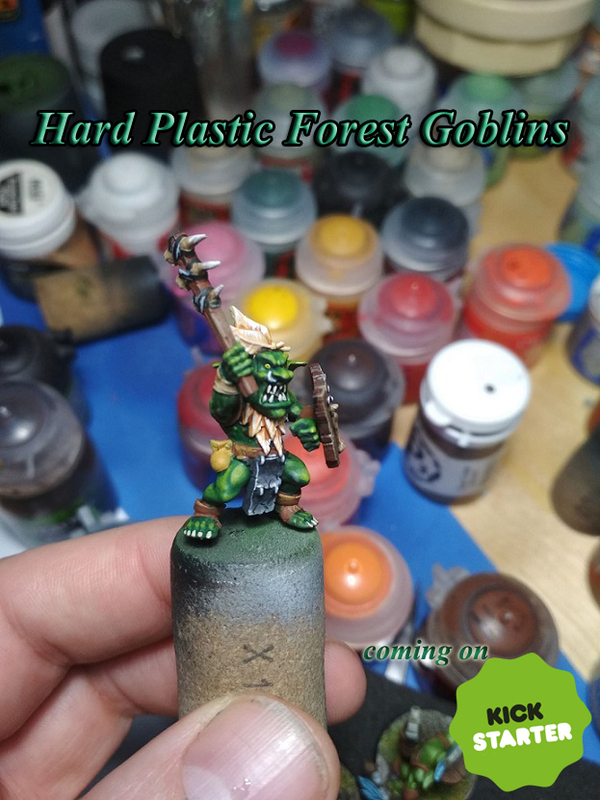 Here's the first of the heroes we sculpted for the Forest Goblins army. They seem to have the Sisters of Faith, but not the Talliareum Paladins. I don't know TBH, you'll probably need to contact them directly. That goblin master archer is pretty COOL!!! Whats going to be scale of it? Make sure tou cast them really small! 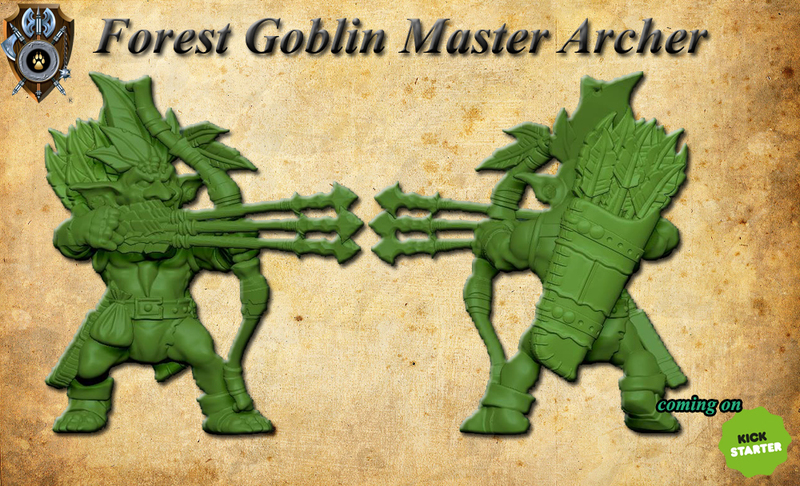 Aye if these scale up well with the more modern GW Forest Goblins(the ones from the Arachnarok for ex. rather than the old common Goblins), I'm going to have to sell some stuff to go in on this heavy. With the spears, the lesson isn't to show less, it's to remember that not all backers will be involved in a KS campaign at once, so something important like that in an update will probably not be read by later backers, nor by backers who "fire and forget" on a campaign without reading every update (I usually fit into both categories these days). The other part of it is with something like the Sisters would be to state that "we may or may not include these". But honestly, if it's a pre-order you should provide customers with as much information as possible so they can make informed decisions with their hard earned money. That's why I didn't pre-order them. Dakka will always be more prickly than something like Facebook, because shy of personal attacks and getting way out of line, people aren't heavily censored here, and people will not hold back on telling you when you make a misstep. The upshot of that is that you get more substantial feedback here - and yes, some of it can be both harsh and critical. Facebook to me feels more like an echo chamber, and the main interaction is just clicking "like", so it certainly is "friendlier", but you won't get the same kind of feedback. I've got nothing useful to say on the topic of right-hand-held bows. I personally think they'd be a cool idea, but you might get better feedback on the 9th Age Forums or somewhere like that, as WHFB/9th Age players might prefer more uniform models in their blocks of infantry. 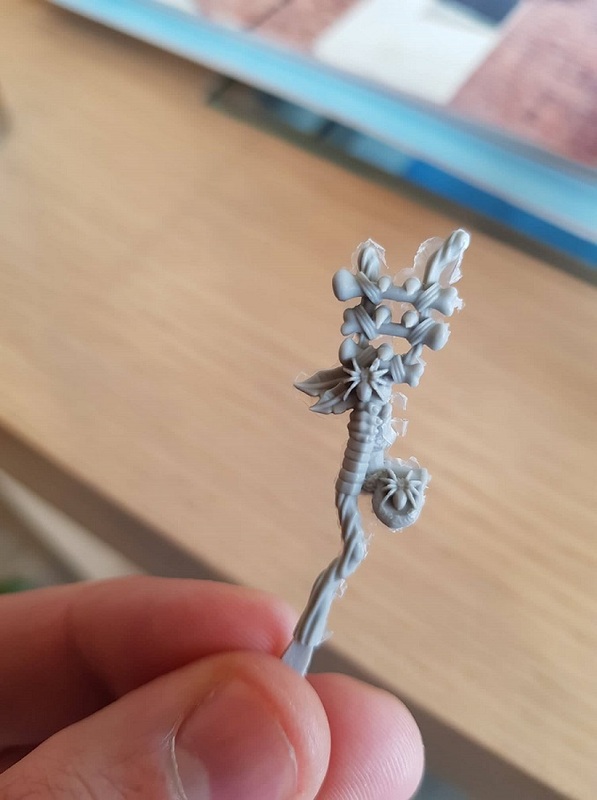 I'd say if you have space on the sprue for them to be an extra piece so people can still have their unit of 20 or whatever holding their bows in a uniform left hand, then just go for it. With those shield renders, they look great on the side that's shown. Are they just flat and undetailed on the rear side, or is there also detail on the reverse? For the goblins and their oversized weapons, perhaps they could predominantly use dagger-type weapons from your other ranges? After all, Sting and the hobbits' Wight-blades used as sword by them were actually daggers from the larger races in LotR. Failing that, you could just scale them down by 20-25-30% while maintaining the designs and then scale them back up for the actual other races. You still maintain the visual consistency within your model ranges and their world, but the goblins then look more balanced. If you need a lore reason as for why a looted Goblin gladius or khopesh or whatever is smaller than a Human one, the answer is that the goblins kept the smaller ones for their own use and traded the larger, more unwieldy ones away to (other faction) for (whatever). I assume that like in IRL history, Iron is still a valuable commodity. Wolf cavalry look amazing. Hope you can vary the riders and wolves a little beyond the shields once they go further towards production renders. Uh.. you're planning to do Fantasy and Sci-fi in the same campaign again? Your call of course, but if so, expect a similar reaction to the Sisters when the next SG is for the "other" faction. I'm also not sure if 40k-style Not-Gretchin will be as popular as Goblins due to the way the armies work in GW's games. But then I guess there are still a lot more 40k players than fantasy, so maybe it'd balance out? I appreciate the detailed post. The sci-fi faction is a bonus, we are more interested in the fantasy. If it unlocks as a SG, so be it. If there's so much interest on them, then we can always do a separate KS just for the little sci-fi fellas. From our research the Drotts (common goblins) have sapce in the market, especially if the match the Forest Goblins range, completing their army. Although there's no more time to resculpt the downscaling of some of the weaponry, we are open and positive in revisiting that. We are looking forward to sharing the preview/draft page in the coming days. The emblem looks like it's upside-down. 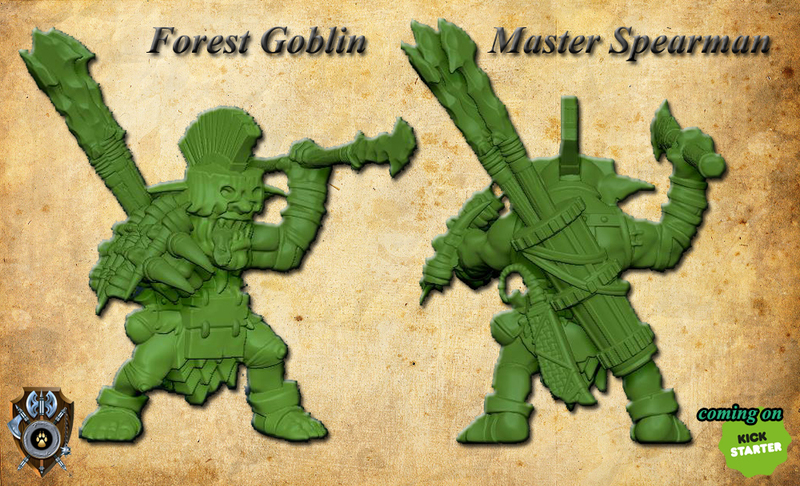 Here's our Forest Goblin Master Spearman. Ummm, the front and back view dont match.. his spear and shield switch hands and the quiver also..
Obviously computer render and it got turned and mirrored. Though it should be more mportant for them to fix it so the backers know which arm the spear will be in and which the shield will be in. Very interested.will hold off on buying the 30 GW gretchin I still need. Having the badge on the shield upside down is one thing (although having the wooden mask the right way up then kind of kills that for consistency) but having the gun upside down as well is what makes it look like the whole thing has been accidentally inverted. Yes that's what I meant. Sorry if it wasn't clear, I was talking about the whole thing (shield, sword and gun) not just the face. We'll post the emblems of all factions, we like creating emblems as it gives each race more "character". To each their own, in our world Goblins are fierce and cunning yet weak if not in numbers. They are not dumb, on the contrary they are amongst the best engineers available. That said, here's the first draft for those interested, C&C very welcome! We still haven't uploaded painted samples, size comparison photos and video, this is mainly to get the main idea of what we are aiming for. PS. Going to bed, it's 06.05' a.m. enough work for now! We will be changing the "blurry" renders of our characters (spider shaman and master spearman), plus we have added a size comparison and add-on section. We are working on some graphics, awaiting video, painted miniatures etc. You probably should not put the toad cavalry and the words "hard plastic" in the same place if they're not. Goblin looks great. Definitely interested in this. I like the Goblins design, but the proportions are not to my taste. These days, I'm scouring the market for more Goblin Slayer style gobbos rather than heroic scaled gobbos. 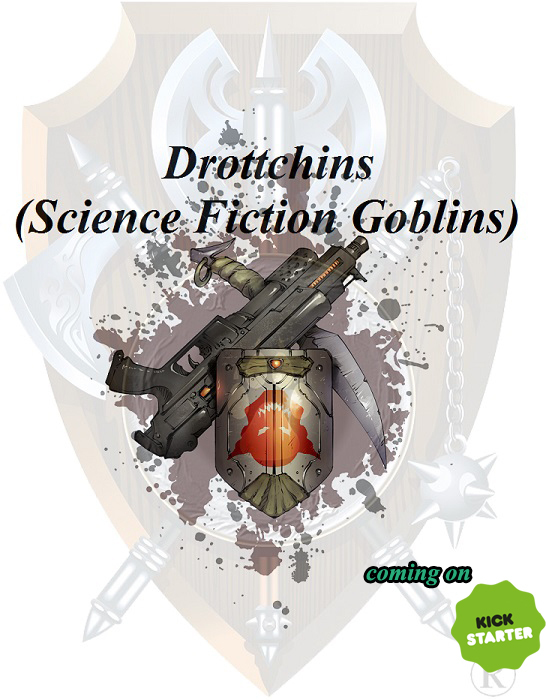 I do like the work shown and I wish Shieldwolf quick and copious funding, but these just aren't the goblins I'm looking for right now. 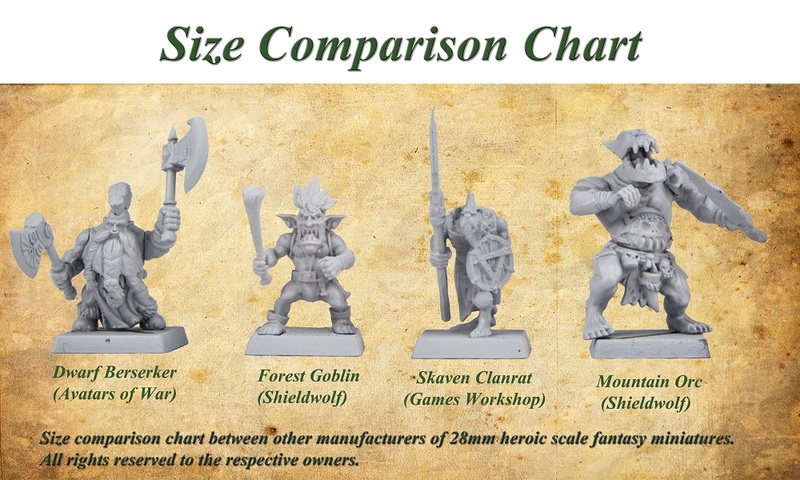 Goblin Slayer Goblins are IMO also Heroic Scale, just less so than the Shieldwolf Gobbos. The forest behemoths look great! I hope we’ll see some other big beasties for these goblins as well. We are awaiting painted samples of both our fantay and sci-fi behemoths. For obvious reasons we can show off only the fantasy versions for the time being. With a little luck the project launches end of this week, otherwise it's Monday the 18th. We can delay no longer than that. Ah, we wouldn't know about the modern ones, to our knowledge said company didn't release any new infantry regiments, kept the previous ones, no? Even so, these could simply be considered "beefier" since they are more "savage/primitive" looking? Either way, definitely two ranges that fit. Anyway, getting really close to launch, last WiP report we received, hopefully you like the color scheme the studio went with (we give carte blanche to our artists). 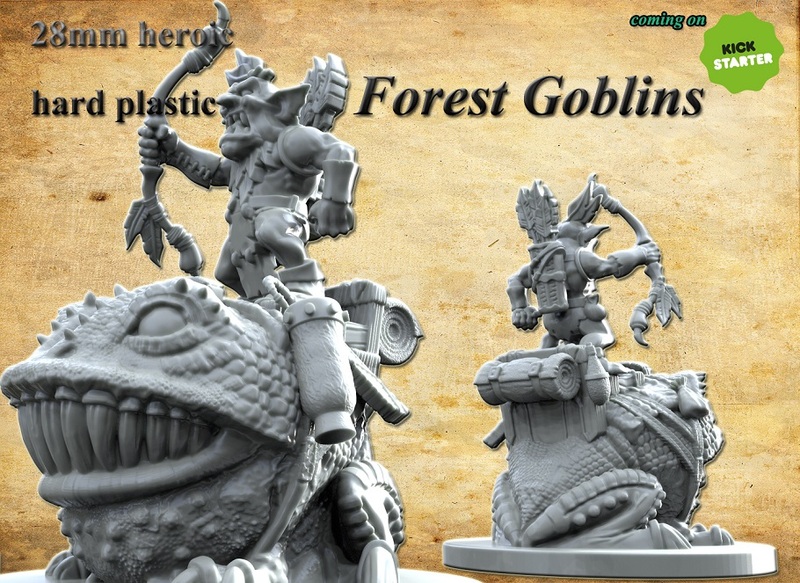 The Forest Goblins from both the plastic Spider Riders that originated in the 7th Edition boxed game and the crew for the Arachnarok spider are scaled to fit in with the modern Night Goblins, all of which are significantly smaller and differently proportioned to the "classic" Goblins. Unfortunately I have quite a few of the former, and I'm a stickler for consistency.